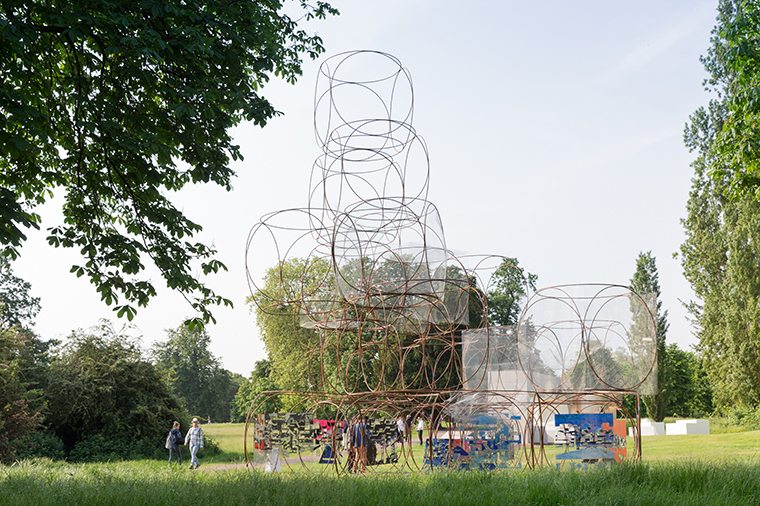 Yona Friedman, Serpentine Summer House, 2016. Photo: Iwan Baan. 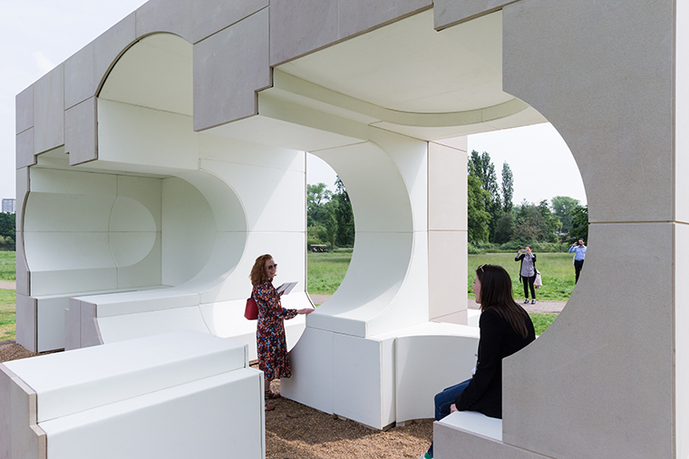 The Serpentine's annual pavilion commission stretches the boundaries of contemporary architectural practice and is the most ambitious architectural program of its kind worldwide. 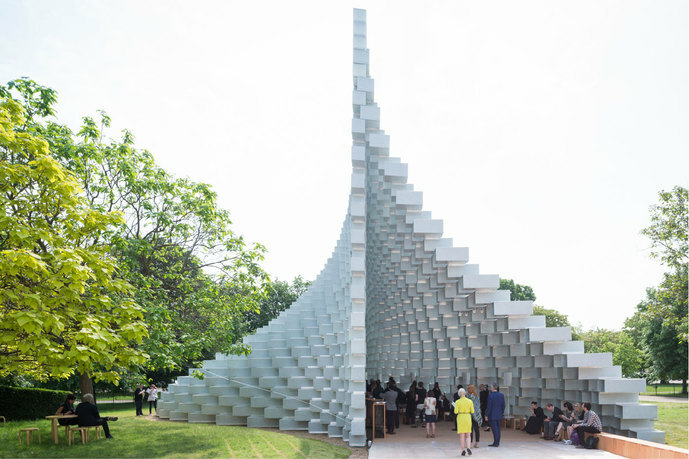 The 2016 Serpentine Pavilion, designed by Bjarke Ingels Group (BIG), features an "unzipped wall" that transforms from a straight line into three-dimensional space, creating a dramatic structure that by day entrances the public and hosts free family activities, and by night becomes a space for the Serpentine's acclaimed Park Nights program of performative works. The four Summer Houses are inspired by nearby Queen Caroline's Temple, a classical style summer house built in 1734. In line with the criteria for the selection of the Pavilion architect, each architect has yet to construct a permanent building in England. These commissions introduce contemporary architects to a wider audience, parlayed through a built structure rather than exhibitions of models, drawings, and photographs. 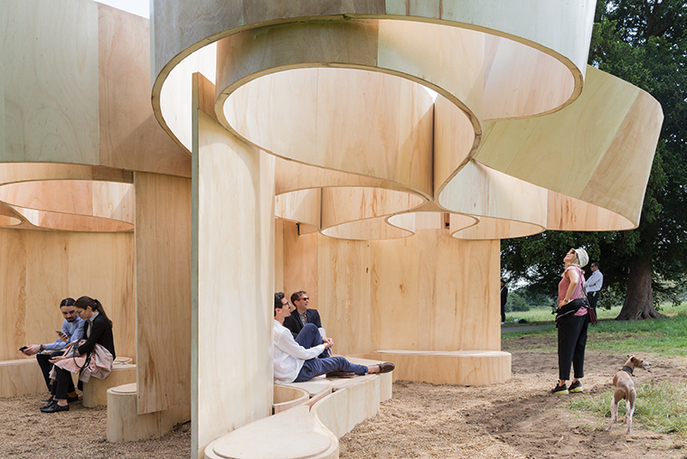 The summer house architects are Kunlé Adeyemi, Barkow Leibinger, Yona Friedman, and Asif Khan. Bjarke Ingels is a Danish architect. He heads the architectural practice, Bjarke Ingels Group (BIG), which he founded in 2005, with offices in Copenhagen and New York. BIG is led by founding partner Bjarke Ingels with eleven additional partners: BIG currently employs around 300 architects, designers, builders, and thinkers who come from more than twenty-five countries representing Scandinavia, North America, Latin America, the Far East, and continental Europe. Ingels has won numerous architectural competitions and awards, including AIA National Architecture Honor Award (2015); AIA NY Urban Design Merit Award (2015); RIBA Award European National Winner (2014); Architizer A+ Awards (2014); Progressive Architecture Design Award (2013); Nordic Light Award (2013); International Economic Development Council Excellence Award (2012); Crown Prince Culture Prize, Danish Culture Fund (2011); Scandinavian Green Roof Award (2010; Cityscape Dubai Award (2009). Kunlé Adeyemi is a Nigerian architect, urbanist and creative researcher. His recent work includes Makoko Floating School, a floating structure on the lagoon of Lagos, Nigeria. This acclaimed project is part of African Water Cities, an extensive project developed by NLÉ, an architecture, design and urbanism practice founded by Adeyemi in 2010. NLÉ is currently developing a number of projects, including Rock-Chicago Lakefront Kiosk; Chicoco Radio Media Centre; Port Harcourt and Black Rhino Academy, Tanzania. Born and raised in Nigeria, Adeyemi studied architecture at the University of Lagos where he began his practice, before joining Office for Metropolitan Architecture (OMA) in 2002. At OMA he led the design, development and execution of several prestigious projects around the world. Adeyemi is a juror for RIBA's 2016 International Prize and adjunct associate professor at the Graduate School of Architecture, Planning and Presentation, Columbia University, New York. Barkow Leibinger is an architectural practice based in Berlin and New York, founded in 1993 by Frank Barkow and Regine Leibinger. 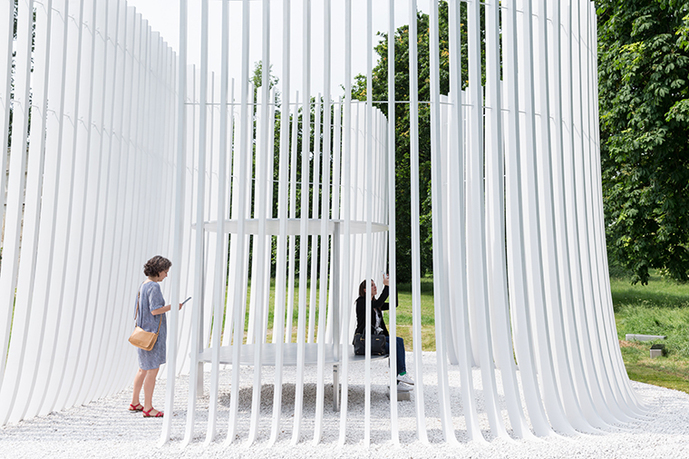 Barkow Leibinger's work includes building for the work place, cultural, housing, exhibitions, and installations. Important milestones are the Biosphere in Potsdam, Germany; the Gate House and the Campus Restaurant in Ditzingen, Germany; the Trutec Building, Seoul, Korea; and the Tour Total, Berlin. Recently completed is the Fellows Pavilion for the American Academy in Berlin. Their work has been shown at the Venice Architecture Biennale in 2008 and 2014, the Marrakech Biennale in 2012, and is included in the collections of MoMA and other museums. They have won numerous awards, such as the Marcus Prize for Architecture; three National AIA Honor Awards for Architecture; the DAM Prize for Architecture; and a Global Holcim Innovation Award for sustainability. Yona Friedman is a Hungarian-born, French architect. His theory and manifesto L'Architecture Mobile, published in 1958, championed the inhabitant as designer and conceptor of his own living space within spaceframe structures. Friedman's projects have included the College Bergson in Angers, France; the Museum for Simple Technology in Madras, India, for which he received the Scroll of Honour for Habitat from the UN; and other projects for which he received the Architecture Award of the Berlin Academy, the Grand Prize for design of the Prime Minister of Japan amongst other international honours. He has taught at Harvard University, Columbia University, MIT, Princeton University, and University of California, Berkeley; and participated in the Venice Biennale three times (2003, 2005, and 2009) and the Shanghai Biennale in 2004. He continues to be the subject of international exhibitions and hundreds of articles. More than forty books have been published about him. Asif Khan founded his architecture practice in 2007. The studio works internationally on projects from cultural buildings to houses, temporary pavilions, exhibitions, and installations. 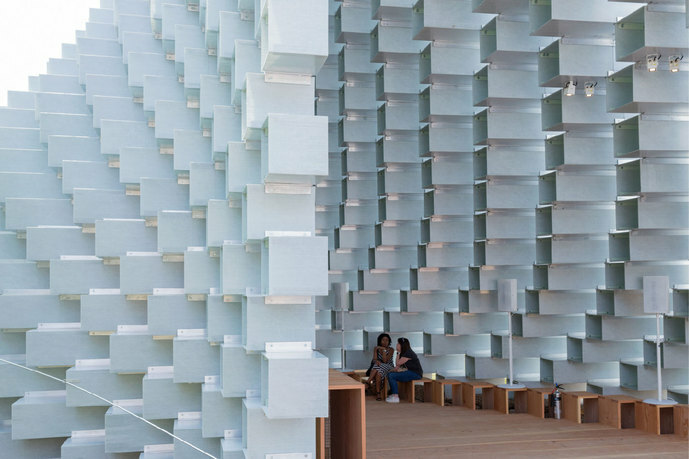 Recent notable projects include the MegaFaces Pavilion at the 2014 Sochi Winter Olympics and the Coca-Cola Beatbox Pavilion at the 2012 London Olympics; most recently, he was a finalist for the Helsinki Guggenheim Museum and the British Pavilion competition at the 2015 Milan Expo. He is the recipient of numerous awards, including a Red Dot Award for Design, the Cannes Lion Grand Prix for Innovation, a D&AD award, and a special citation for the 2011 Young Architects Program from MAXXI + MoMA/PS1. Julia Peyton-Jones was director of the Serpentine Galleries and codirector of exhibitions and programs for twenty-five years. 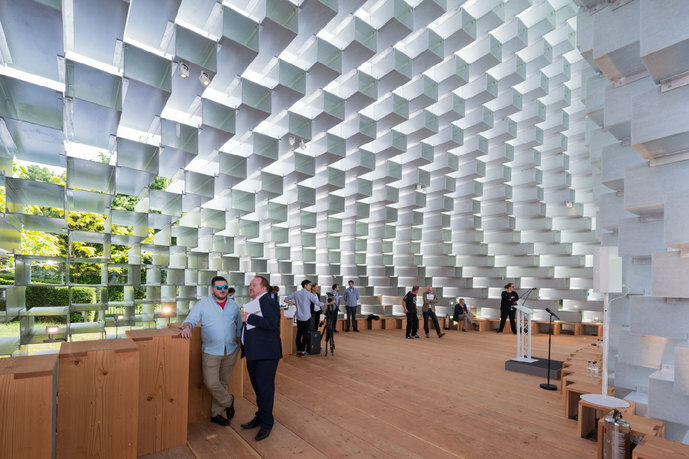 Peyton-Jones conceived the Serpentine Pavilion program in 2000 as a pioneering way to present exhibitions of contemporary architecture to the public in the form of built space rather than plans and models. Hans Ulrich Obrist is the codirector of exhibitions and programs and director of international projects at the Serpentine Galleries. Since joining the Serpentine in 2006, Obrist has played a key role in defining and curating the Pavilion public program, primarily the marathon events which close the Pavilion season, and has subsequently inspired similar events in Reykjavik and at the Solomon R. Guggenheim Museum of Modern Art in New York. Lizzie Carey-Thomas joined the Serpentine Galleries in October 2015 as head of programs. She was previously curator of contemporary British art at the Tate Britain for 16 years. During her time at the Tate, she co-curated the Art Now series of projects for emerging artists (2002–12); she has also been lead curator of the Turner Prize since 2002. In 2012, she served as head curator for the exhibition Migrations: Journeys into British Art, which explored the impact of migration on 500 years of British art. Most recently, Carey-Thomas inaugurated Contemporary Projects (a series focusing on emerging artists) with The Weight of Data. 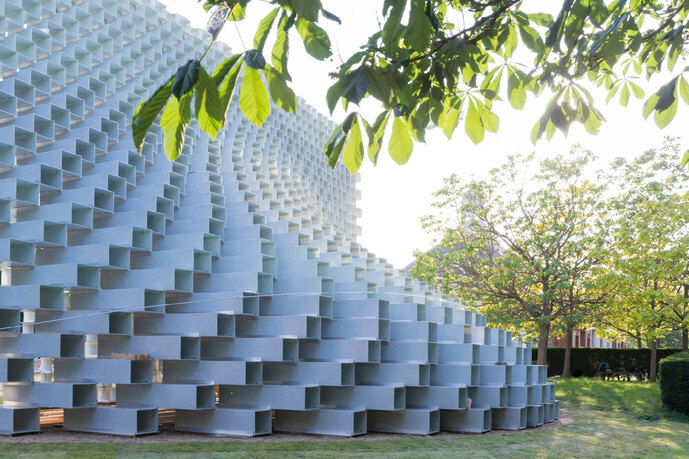 Since 1970, the Serpentine has gained an international reputation for excellence, working with over 2,876 artists, architects and designers for forty-six years, offering innovative ways for people of all ages to engage with modern and contemporary art through its exhibition, architecture, design, education, and public programs. The Serpentine develops and delivers community and education-based projects that open out the benefits of the arts to children and adults of all ages and backgrounds.